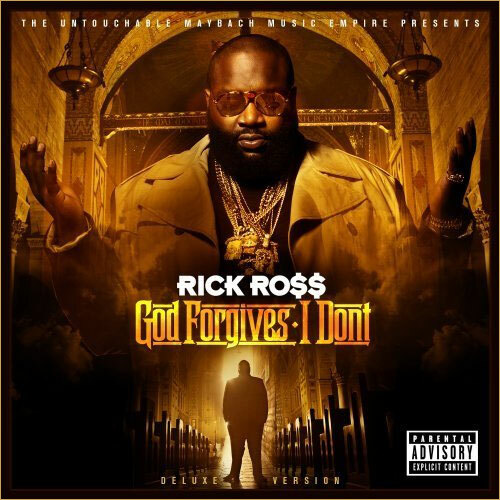 In keeping with the spirit of the 2012 Olympic Games, Rick Ross clearly goes for the gold with his fifth album, God Forgives, I Don’t. Judging by the tracklist, he’s spared no expense. The album is bursting at the seams with high profile guest stars and top notch production. Though not quite the distinghuised gathering it’s host intended, it nonetheless manages to be a gala event. In keeping with the religious (or perhaps sacrilegious) themes evoked by the album’s title, “Pray for Us” asks God’s forgiveness, presumably for the sins that will be committed throughout the duration of the LP. The sentiments expressed ring particularly hollow considering the unabashed indulgence in earthly pleasures that follows. Things perk up considerably with “3 Kings,” which features Dr. Dre and Jay-Z. Producer Jake One channels Just Blaze when using a rousing sample from “I'm So Grateful (Keep in Touch)” by Crowns of Glory. Heavenly choral wailing glides over crashing high hats and piano keys. Jay-Z’s closing verse feels inspired, as It perfectly encapsulates the vibe of the entire song. “Sixteen” is actually an elegant duet with Andre 300. Soothing violins sway as if conforming to the whims of a gentle summer breeze. The drums meld with the listener’s heartbeat, while handclaps infuse tiny jolts of adrenaline. Lyrically, Andre 3000 outshines Ross in every conceivable way. His verse transitions effortlessly from one topic to the next without ever devolving into muddled abstraction. It’s also refreshingly substantial, leaving the listener with ample food for thought once the song is over. Cardiak valiantly attempts to extend the musical highs achieved by the J.U.S.T.I.C.E League with the haunting “Amsterdam.” A female vocalist whales a lonely, nasal cry into a hollow cavern while an oozing bassline flows just beneath. It doesn’t quite measure up to the songs that immediately precede it, but it’s worthy offering nonetheless. At this point the album makes the inevitable though jarring, shift into Trapstar territory. “Hold Me Back” benefits from an amusing hook, though the song itself is something of a creative void. All the expected sonic trappings (pun intended) of the subgenre are prevalent, from the imposing 808’s to the overly prominent synthesizer keys. The foreboding “911” is only slightly more complex, combining wailing sirens with horror movie keys to keep the listener on high alert throughout. Unfortunately, the lack of a compelling hook brings the song down quite a few notches. The album transitions into its third and final act with “Presidential,” which offers a bit of musical respite from the drama that has come before. Pharrell Williams facilitates a bit of poolside relaxation with electronically manipulated vocals over slow rolling drums. The crashing claps and high hats of “Ice Cold” get the blood pumping, but feel relatively barren compared to the layered instrumentation found elsewhere on the album. To his credit, Omarion’s vocals do add a bit of substance. Drake provides the hook for “Diced Pineapples” which feels vaguely reminiscent of his “Over My Dead Body.” Lush, lonely piano keys are allowed to take precedence as the drums are dialed way down. Wale opens the song with a bit of sexually suggestive spoken word poetry, and even contributes a verse. J.U.S.T.I.C.E League returns to close out the set with “Ten Jesus Pieces.” The exquisite combination of instruments brings the album in for a smooth landing. Rick Ross was perhaps a bit too focused this time out, as God Forgives, I Don’t is consistent to a fault. The balance of power clearly favors the kind of slow, smooth tracks that allow Ross to flex his lyrical muscles a bit more. While that choice is definitely preferable to the trapstar monotony that he indulged on Rich Forever, it makes the album feel a bit uneven. This is definitely an album that could have used a bit more variety. God Forgives I Don’t is yet another exceptional album from Rick Ross. It earns its place alongside Deeper Than Rap and Teflon Don, as it exhibits many of the same virtues. That being said, it’s time that even the most ardent Rick Ross supporters acknowledge the obvious: He might well be incapable of delivering a genre bending classic. Though the ultimate prize continues to elude him, his taste in beats remains exquisite, and his dedication to his craft is evident. Any artist that continuously strives for musical excellence is worthy of the utmost respect.